Pop. 195. In the town of Caledon, Peel Region on the Credit R. and C. Rds. 9, 19 & 25, 14 km NW of Brampton. Pop. 578. Part of the Town ofCaledon, Reg. Mun. of Peel, on the Credit R. and C. Rd. 12, 1 km W ofHwy 10, 19 km NW of Brampton. In Chinguacousy T., Peel C. on Hwy. 10 and C. Rd. 9, 10 km NW of Brampton. Shown on an 1875 map. Pop. 320. 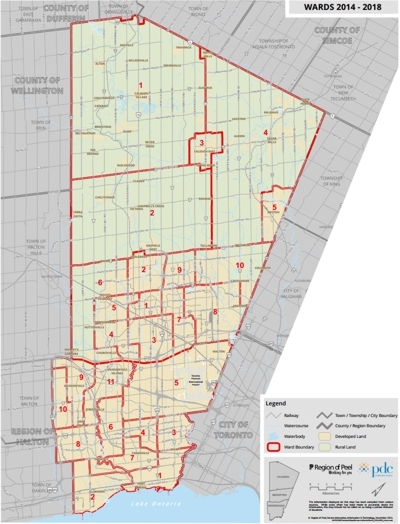 Part of the Town of Halton Hills and Erin T., Wellington C. on C. Rds. 24 & 42, 25.5 km. 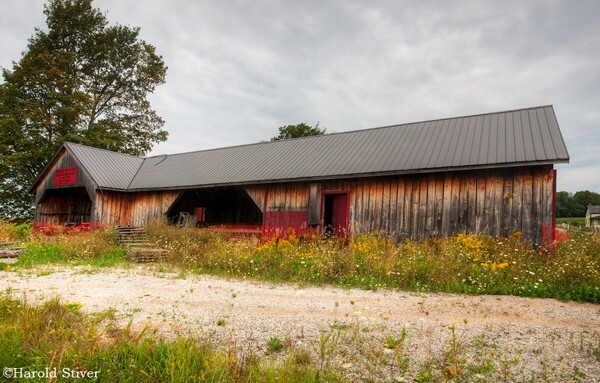 NE of Guelph. Pop. 230. In Reg. Mun. 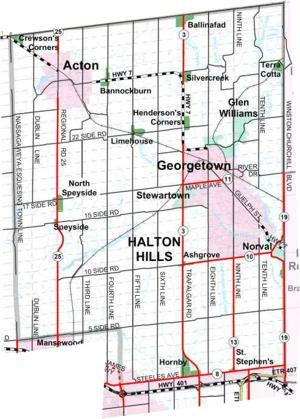 of Halton Hills on the W branch of the Credit R., 23 km. SW of Brampton. Pop. 296. Part of the Town ofCaledon, Reg. Mun. of Peel, on the West Br. of the Credit R. and C. Rds. 1 & 11,24 km. NW of Brampton. Pop. 240. In Erin T., Wellington C., at the junction of C. Rds. 24 & 124, 28 km S of Orangeville.
. 2,086. Part of the Town ofCaledon, Reg. Mun. of Peel on C. Rds. 7 & 22,24 km NW of Brampton. Pop. 86. In Chinguacousy T., Peel C. on C. Rds. 7 & 9 24 km NW of Toronto. Pop. 755. In Mono T., Dufferin C., on the Humber R. and Hwy 9 and Airport Rd., 9 km NE of Orangeville. Caledon Pop. 39,837. On the Credit R. and Hwy 10,24 km NW of Brampton. Pop. 45,000. Part of the City of Brampton, Reg. Mun. of Peel, in Chinguacousy T. on Hwy 7,3 km. E of Brampton. Pop. 260,498. In the Reg. Mun. of Peel on the Etobicoke R. and Hwys 7 & 10, and C. Rds. 6 & 107,32 km. W of Toronto. Pop. 500. Part of the City of Brampton, Reg. Mun. of Peel, on the Credit R. and C. Rds. 1 & 6, 6 km. SW of Brampton. Pop. 500. 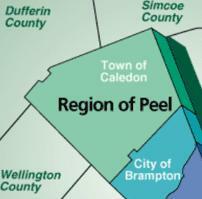 Part of the City of Brampton in the Reg. Mun. of Peel on Hwy 10 and C. Rd. 14,8 km. NW of Brampton. Pop. 2,785. In Neelon T., Sudbury Dist., on Hwy 17 and C: Rd. 90, 13 km. E of Sudbury. Pop. 396. In Cleland T., Sudbury Dist., on the Wanapitei R. and Hwy 537, 16 km SE of Sudbury. Pop. 1,025. Part of the Town ofCaledon, Reg. Mun. of Peel, on the West Br. of the Credit R. and C. Rd. 136, 82 km. NW of Toronto. Pop. 1,164. In Erin T., Wellington C., on a branch of the Credit R. and C, Rd. 24, 34 km N of Guelph. The village was founded in the late 1840s and named Hillsburgh when the post office was established in 1851. Pop. 500. In Oro and Orillia T., Simcoe C., N of Bass L., on Hwy 12 and C. Rd. 22, 8 km. W of Orillia. The post office, opened in 1874, was named for early settler Thomas Price Sr. Pop. 44. 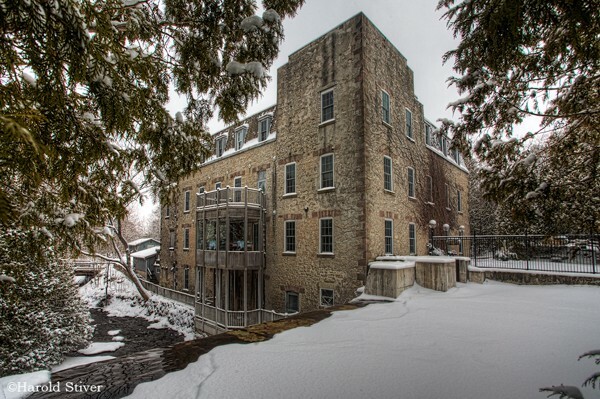 In Eramosa T., Wellington C., on C. Rd. 24, 13 km NE of Guelph. Pop. 68. In Erin T, Wellington C. on Ospringe Cr, a tributary to the Eramosa R, and C. Rds. 124 & 125, 20 km NE of Guelph. First shown on an 1861 map.